As mentioned before you should be pushing your regular ministry website content to Facebook instead of using Facebook, or any other social network, as the main platform for your information. I have recently found a new tool that seems to address some of the concerns I had with other RSS feed importing tools I was using. One of the biggest advantages to NetworkedBlogs is that it seems to update my Facebook profile immediately when I add information to my website. The second thing that I like about NetworkedBlogs is that in the post to my profile it gives a link directly to my site. I don’t end up with the problem of people only reading and commenting at Facebook without going to the website to see the information presented in the controlled environment that I have created. To get started with NetworkedBlogs you will need to visit their application page within Facebook. This will allow you to add your blog to their list of networked blogs. The application will ask you for the name of your blog, a short description and the main web address for the website. Be aware that this will work even if you are not using a “blogging” platform but still have an RSS feed that either gets updated manually or automatically whenever you add content to your website. You are then asked to prove that you are the author/owner of the content that you are linking to. You can confirm this information in a couple of ways. The quick way is that you can add a “badge” to your website. While this might be good if you were trying to drive general traffic to your site, I prefer to keep my ministry website focused to just my friends and supporters. Therefore, my preference for confirmation is to ask friends to click a link and confirm that I run the website. 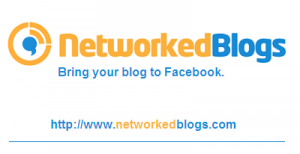 It takes more time, but I feel less obligated to the NetworkedBlogs network. If you use their badge on your site I am not sure how long you need to leave it active to get confirmation. It may be that you can take the badge down immediately after being confirmed. Once you have gone through the previous steps you are now ready to tie the website updates to your Facebook account. They call this syndication. You choose your blog or website from the drop down menu and then set all the settings you need to have the information publish to your Facebook profile. The drop down menu allows you to choose any of the multiple websites that you push to your Facebook account. You are not limited to just one RSS feed. Most of the settings are self-explanatory. You can also visit the NetworkedBlogs information page which will walk you through each of these steps and give you much more detail on the settings options you will be presented. If you have a Facebook Page that is separate from your personal profile you will also be able to syndicate your information there. The advantage to having a Page about your ministry is that all the information presented there can be ministry related. This allows you to keep your standard profile more personal—only containing information that you choose to share with your family and close friends. The NetworkedBlogs application updates your Facebook profile quickly while also driving people to your ministry website. This keeps your Facebook friends informed but allows you to control the way the information is presented by sending readers directly to your website.